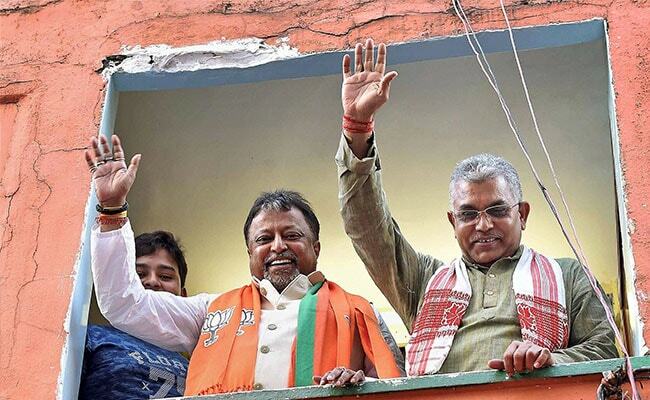 Kolkata: After 20 years in the Trinamool Congress, the party's former general secretary Mukul Roy today arrived at his new address in Kolkata -- the BJP office on 6 Muralidhar Street, just off Central Avenue in the heart of the city. Amid a shower of bouquets and garlands, Mr Roy walked into a press conference with state BJP chief Dilip Ghosh and called for "real poribortan". Poriborton or change was Chief Minister Mamata Banerjee's election-winning slogan against the Left in 2011. "My captain at the Centre is Amit Shah and my captain in Bengal is Dilip Ghosh," Mr Roy added, hugging the latter in public. Finally, in line with his promise to deliver Bengal to the BJP by 2021, Mr Roy said, "I have a lot to reveal. 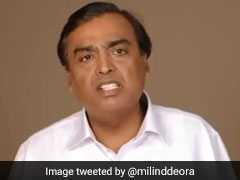 I will reveal many things on November 10 at the BJP rally in Kolkata." Dilip Ghosh welcomed Mr Roy, saying, "You have taken a leap from a pond into an ocean." However, other senior BJP leaders like parliamentarian Babul Supriyo or Mr Ghosh's predecessor Rahul Sinha were conspicuous by their absence. Rumblings within the state BJP against Mukul Roy are no secret. In fact, Dilip Ghosh himself has been cool toward the former Trinamool leader in the recent past, especially on Mr Roy's alleged Narada links. "We will not compromise on corruption," Mr Ghosh has often said. The Trinamool has maintained pin drop silence on Mr Roy, barring a few lukewarm comments over the weekend, predictably, about Mr Roy having no real impact on Mamata Banerjee's party. "Mukul is bad news for BJP," a senior Trinamool leader, who asked not to be identified, told NDTV. "It shows they are so short of leaders in Bengal, they will even take someone linked to scams like Narada." In an interview to a Bengali news channel, Mr Roy was asked if others in Trinamool would follow in his footsteps. He said, in December 1997, when Mamata Banerjee and he broke away from Congress and formed Trinamool, not a single Congress legislator had joined them. But by the time 2001 elections came along, things changed dramatically. "So wait and see," Mr Roy said. "There are many people in the queue."